The last time I wrote about the Philadelphia Flyers’ goaltending situation, I speculated on what direction they could take between the pipes with what they had in their system. Also, Ron Hextall was still General Manager, Dave Hakstol was still the Head Coach, and they had just iced 3 different goalies in a 6-game playoff series against the Pittsburgh Penguins. And now, as I write about the Flyers once more, the Carter Hart era is officially underway in Philly. Carter Hart is the 2nd-round pick (48th overall) of the Philadelphia Flyers in the 2016 NHL Entry Draft. The 20-year old native of Sherwood Park, Alberta spent his entire junior career with the Everett Silver Tips in the WHL, playing for them as recently as a season ago. His ascension from the CHL, to the World Junior stage, to the AHL, and now to the NHL has been almost unprecedented, as most goalies who are drafted typically spend a number of years honing their craft in the minors. Whether or not that was the plan for Hart for this season and more is negligible, as he has earned his spot in the blue paint at Wells Fargo Center in Philadelphia. Hart has been on most everyone’s radar as one of the brightest young goalies coming out of junior hockey for some time now. In his last two seasons with Everett in the WHL, the 6’2″, 181 lb netminder posted exceptional numbers for a junior goalie: a 1.99 GAA and .927 SV% in 2016-17, and a 1.60 GAA and .947% SV% in 2017-18. These numbers were posted across a sample size of 95 GP, 41 in his last season and 54 the season prior. 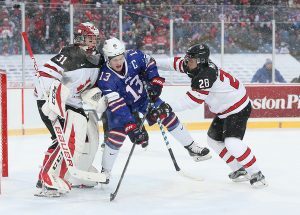 These numbers also earned him consecutive appearances for Team Canada in the World Junior Championships, where he backstopped Canada to a Gold medal against the United States in Buffalo just a year ago. Hart finished the tournament with impressive numbers, a 1.81 GAA and .930 SV% in 6 GP. A Gold medal in the WJC isn’t the only time Carter Hart has come in clutch for his team, and it’s certainly not the only hardware he has to his name. In winning 30 games in three out of his four WHL seasons, Hart earned his spot on the WHL West First All-Star Team in 2016, 2017, and 2018, was the CHL Goaltender of the Year in 2017 and 2018, and was the WHL Player of the Year among all players in the league in 2018. It’s evident that at the ripe, young age of 20, Hart already has himself a laundry list of accomplishments and accolades to show. 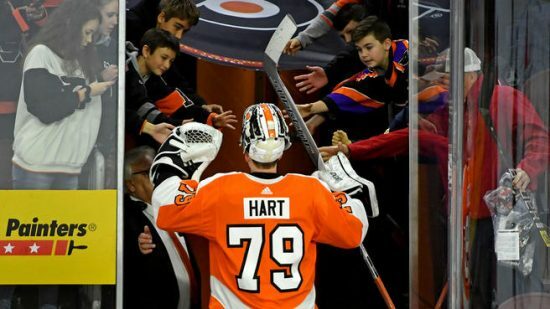 The Philadelphia Flyers were hoping that, in starting him with their AHL affiliate Lehigh Valley Phantoms to begin the 2018-19 season, Hart would continue his record of excellence and prove himself more than a boy among men. The results they had hoped for didn’t necessarily come immediately, if at all in the AHL. In 17 GP before being recalled by the Flyers, Hart managed a 9-5-1 record, mustering pretty average stats, with a 3.05 GAA and .901 SV%. However, the save percentage speaks more fondly and accurately of his play than the goals against average, naturally. The Flyers would have been content to let Hart ride out the season in the crease for the Phantoms, provided they got the steady goaltending for the big club they haven’t had in oh, so long. In true Flyer fashion, though, not a thing has seemed to go right for them this season between the pipes. The Flyers tied a League record for most goaltenders iced through a team’s first 25 games of the season (5), with the 2003-04 Atlanta Thrashers. And, albeit injuries definitely played a role in this game of goalie roulette, anytime you tie a League record set by the Atlanta Thrashers, well…it’s not exactly a shining moment. 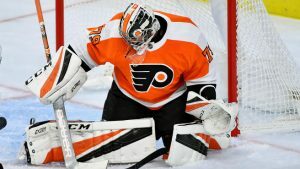 The Flyers ran through their own Brian Elliott, Michal Neuvirth, Anthony Stolarz, and Alex Lyon, plus flirted with Calvin Pickard as their starter for a short stint after being claimed off waivers from the Toronto Maple Leafs, later waiving him themselves. And thus, more out of necessity than choice, newly hired GM Chuck Fletcher was forced to play his hand in the crease, and called up Carter Hart. Flyers fans and hockey fans alike were waiting to see what this kid could do in the NHL. Hart himself denied any idea that he’d be a continuation of what Philly fans are used to, saying he wants to become the next longtime starter as soon as possible. And so, the Carter Hart era in Philadelphia seemed underway. All that was left was for him to prove himself. To date, Carter Hart has started just 2 games for the Flyers, going 2-0-0 winning in consecutive starts last week. In his NHL debut against the Detroit Red Wings, Hart allowed just 2 goals, making 20 saves on a modest 22 shots. A respectable workload, but nothing extraordinary, as that measures out to a League average .909 SV%. It was enough, however, to earn him his second straight start, this time against a much more formidable opponent. Hart and the Flyers would face the juggernaut Nashville Predators in what was just Hart’s second League start, and this would prove to be his first true test. Long story short, he passed with flying colors. Hart would allow just 1 GA, making 31 saves on 32 shots against one of the best teams in the entire NHL. A .969 SV% in this game to go along with the 1 GA is a performance Flyers fans haven’t been treated with in what seems like ages. After the first game, people were probably more skeptical than excited. After the second game, it was probably the other way around. Albeit across an incredibly small sample size of just a pair of games, Carter Hart has impressed so far with his performance in the Flyers crease, and looks poised to have a genuine runway to carry himself and the team in front of him as far as he can take them this year. For a team that was so desperate for a shred of good news these past few weeks, fans can take solace in the fact that they have a young, promising goalie of the future (hopefully). Either way, keep an eye on Carter Hart for the rest of this season, and for years to come. He could just be the next big thing.